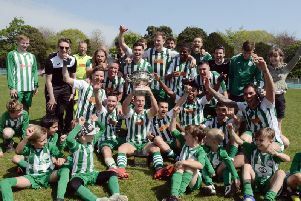 It wasn't a week to cherish for Midhurst, Selsey or Sidlesham - all lost their latest Southern Combination division one games. Reports below. Southwick started brightly with the Stags looking a bit lacklustre. The visitors took the lead in the tenth minute when a long ball was played over the Stags back four to Ryan Stevens, who ran through, rounded Josh Bird and slotted home. The Stags responded well and Jake Slater rose highest from a corner and forced Tyler D’Cruz in the visitors’ goal to make a smart stop. Minutes later Slater got through and again D’Cruz made a good stop. Charlie Merritt got in down the left and whipped a ball into Josh Sheehan, who got in round the back and his volley came back out off the post. Gary Norgate struck a shot from inside the area and again D’Cruz made a good stop, tipping the ball on to the post. After four big chances went begging inside a good 15-minute spell for the Stags, another long ball was played over the top and Nana Baah got through to slot home. The Stags came out strongly in the second half and Slater got free inside opening minutes and again D’Cruz made a good stop. Several more chances went begging for the Stags before Norgate pulled a goal back in the 70th minute. Kieran Carter put in a great cross from the left and Norgate guided his header in. The Stags went down to ten men in the 75th minute when Casselton picked up a silly second booking. Midhurst kept pressing with D’Cruz making several saves and commanding his area well. The Stags pushed all the way to the end and Southwick can thank their keeper for the points. Midhurst: Bird, Casselton, Merritt, Carter, Broughton, Farr, Sheehan, Brown, Slater, Norgate, Dreckmann. Subs: Tollworthy, Carter, Coker, Fewell, Ewen. It was a defeat for Sids against high-flying Bexhill, but the score doesn’t do them justice. Manager Steve Bailey was delighted with his side giving everything but were left to rue missed chances and bad luck as the points were snatched by the visitors late on. Sids should have been in front within five minutes, Ben Mepham going clean through only to shoot tamely at the keeper. Brad Dean headed over from close range and again went close but dragged his shot wide. Sids were excellent in the first half, keeping the division’s top-scoring side contained so much so that Lewis Boughton was virtually a spectator. The second half started with Dean again going close as he burst through but again missed the target. Bexhill came into the game but Sids held firm as usual skipper Rob Madden was immense, supported by Howard Low who was superb. Full-backs Jake Jackson and Cameron Corell were tested by a very powerful forward line but stood firm, and apart from a header that clipped the top of the bar, the visitors were kept at bay. On 75 minutes Lady Luck deserted Sids. A deep cross into the area was headed away by Jackson but it fell kindly to an attacker who fired goalwards. Howard Low went to block the shot and rolled into the corner of the goal leaving Boughton stranded. Sids rallied again and subs Lillywhite and Smith both had half-chances but couldn’t convert. Right on full-time Bexhill doubled their lead with another deep cross and deflection and the game was lost. Sids are home to Oakwood this Saturday (3pm). Selsey boss Daren Pearce felt his side deserved a point after defeat to AFC Varndeanians. The Blues lost 1-0 at home to AFC Varndeanians, and stay in fifth place. The only goal came from Matt Waterman, who scored the winner in the 77th minute. It was Selsey’s first league defeat in ten games, but it came after the Blues were knocked out of the Division 1 Cup by Wick as they conceded in the 87th minute through Wick’s Shane Brazil. Pearce said of the Varndeanians loss: “We were a little bit unfortunate. I think a draw would have been a fair result. We played some good football. We cancelled each other a little bit. It was two good footballing sides and they got the break and we didn’t. “We had a good couple of chances, which we didn’t capitalise on. They had one, and scored from it. Connor [Kelly] made a good save in the first half, so you could argue a draw would have been a fair result. Selsey will look to bounce back when they travel to 12th-placed Billingshurst in the league on Saturday. Selsey: Kelly, Mockford-Allott, Atkinson, Hambleton, Higgins-Pearce, Phillips, Dowdell, Warren, Bassil, Jefkins, Morey. Subs: Miller, Hall, Britton.